Heat oven to 375°F. Spray 9-inch glass pie pan with cooking spray. In 12-inch nonstick skillet, cook ground beef over medium-high heat, stirring occasionally, until thoroughly cooked; drain. Stir in tomatoes, chili beans and 2 tablespoons of the cilantro. Meanwhile, in small bowl, mix sour cream and taco seasoning mix. Place 1 flour tortilla in bottom of pie pan. Spread about 2 1/2 tablespoons sour cream mixture over tortilla. Top with 1/3 of ground beef mixture and 1/2 cup of the cheese. Repeat layers 2 more times. Sprinkle with remaining cheese. Bake uncovered 20 to 25 minutes or until thoroughly heated and cheese is melted. Sprinkle with remaining 2 tablespoons cilantro before serving; cut into wedges. 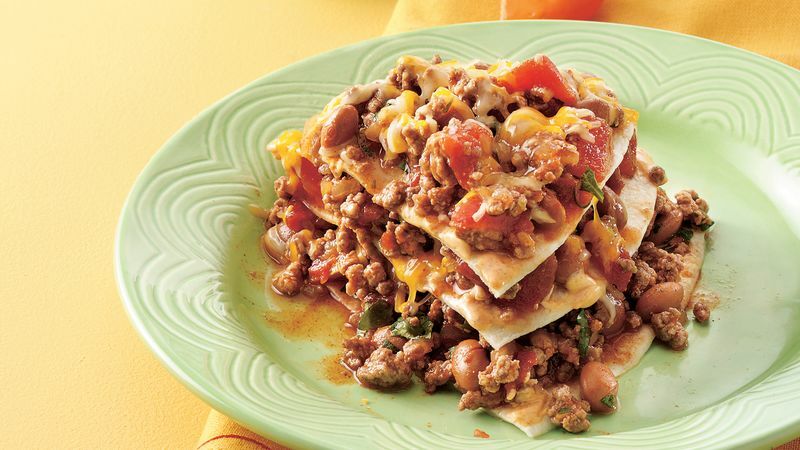 Using a serrated knife makes it easy to cut this multi-layered Mexican entrée.